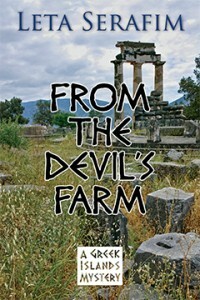 From the Devil’s Farm ($14.95, 208 pp, 6×9 Trade Paperback ISBN: 978-1-60381-244-3), is the third book in Leta Serafim’s Greek Islands Mystery series. The discovery of a murdered child on Sifnos saddens Chief Officer Patronas and his colleagues, who are at a loss for a viable suspect among the migrants that crowd the island or the Greek nationals who resent their presence. “As with Serafim’s previous mysteries, From the Devil’s Farm combines a clever mystery, a spectacular setting (the island of Sifnos), and Greek culture with a good dose of humor mixed in. The tale takes readers from the Greek Islands to Athens and Turkey as the solution unfolds. Throw in romance as Patronas finds himself attracted to a pretty, redheaded pottery instructor, and the result is an enormously entertaining story.” Read more…. The first two books of the series have received high praise from both critics and readers. The Devil Takes Half was a finalist in the mystery category of the Eric Hoffer Awards. A Greek American tourist, Lydia Pappas, stumbles upon a child’s body in the ruins of an ancient temple, well hidden on the top of a cliff. The boy has been bled dry, though no blood is in evidence, leading the Greek police investigator, Yiannis Patronas, to believe the killer must have collected it. Greece’s financial crisis has reduced the police force on Sifnos to one officer, Petros Nikolaidis, so Patronas has been summoned from his home base of Chios to aid in the case. Accompanying him are his colleagues, Giorgos Tembelos and Evangelos Demos, as well as Papa Michalis, an ancient Orthodox priest with a vast knowledge of detective fiction and an uncanny ability to ferret out the truth. Though eccentric and often irritating, Michalis has been an asset to Patronas over the years in a land where homicide was, until recently, a rare occurrence. But Greece is changing daily, with a tide of migrants straining the country’s already diminished resources and occasionally bringing out the worst in her people. The child appears to have been sacrificed according to the rules of a pagan religious ritual. Is someone on Sifnos reviving the old ways? Or is there a thrill killer loose on the island? Is the culprit a Greek national or one of the many foreign migrants crowding its refugee camps? Leta Serafim is also the author of the historical novel, To Look on Death No More. She has visited over twenty-five islands in Greece and continues to divide her time between Boston and Greece. Click here to find her online. The priest’s lengthy robe was giving him trouble and he paused for a moment to tuck a portion of it up into his voluminous drawers, exposing his heavy orthopedic shoes and long black socks held in place around his spindly calves by hideous old-fashioned garters. Patronas looked away, embarrassed for his friend. Normally, he would have made fun of him—the garters alone demanded it, and those drawers, Mother of God, were the size of bed sheets—but today his mind was elsewhere. “I’m worried about this one,” he said. “Yes, yes. Someone like Ted Bundy.” Papa Michalis continued in this vein for a few minutes, enumerating the sins of Ted Bundy, who if he was to be believed, had murdered at least fourteen young women and as many as a hundred. Patronas was sorry he’d brought it up. His friend was fascinated by serial killers and could go on at length, recounting their misdeeds in grisly detail. The names of the men Jeffrey Dahmer had eaten, for example, and which limb he’d usually started with. Or the fact that Jack the Ripper had extracted a kidney from one of his victims and mailed it to a newspaper. While Patronas understood that such people were a challenge for a priest—it was a thorny theological question: how does one forgive the unforgiveable?—he wished his friend would find another hobby. Collecting stamps, maybe. Papa Michalis fancied himself a great crime stopper, the true heir to Sherlock Holmes, but he tended to get carried away. Today was no exception. As inevitably happened once he got going, the priest continued to speculate—brevity was a concept Papa Michalis had no use for—about the nature of the evil. As was his wont, he thundered off in the wrong direction—that of fiction and fantasy and bad American television shows. Later Patronas would recall the conversation. Papa Michalis had been onto something that morning in Sifnos; he just hadn’t realized it at the time. Evil was indeed alive in the universe, and like fear, it was contagious and sometimes infected whole groups, spreading like a malignant virus, a contagion of violence and misery. Ahead, the lava that formed Thanatos shone dully in the sun. A staircase had been cut into the rock, so steep it had been like climbing a ladder. Patronas paused to catch his breath. Nikolaidis and the other men had already reached the top and called down to him to hurry. The steps were deeply worn, cratered from centuries of use. Bending down, he touched one with his hand. Swab it for DNA, you’d probably find Cain and Abel’s.